As we move towards a circular economy, now is the time for brands, businesses and consumers to think seriously about their choice of packaging materials, and their true environmental impact. Gone are the days when you could only find pre-prepared soups and vegetables in a can. Today, these and a range of other tinned goods are available in alternative packaging. As a result, many are confused about which option is best in terms of minimising environmental impact. While tin cans have been at the forefront of packaging technology for over two centuries, less established materials might appear to offer advantages over them. For example, lightweight packaging materials have environmental benefits when it comes to transport. But how to know when such benefits are deceptively short-term, with materials falling short at the end of the packaging life-cycle? To simplify matters, here are three questions to ask when considering different packaging materials. Is it a “permanent material”? What we mean by a permanent material is one that can be recycled over and over again without any loss of quality. Steel is an example of a permanent material – its inherent chemical and physical properties do not change regardless of how many times it is recycled. In fact, steel produced as much as 150 years ago is still being recycled today and used in the manufacture of new products. This is in contrast to some other packaging materials. For example, the fibres of a carton become shorter every time they are recycled – which means that after an average of seven recycling loops 1 there is nothing left of the original retortable carton, a finite life cycle that spirals down into end of life. 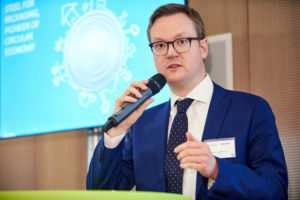 While some packaging materials may demonstrate short-term environmental benefits, it is at the end of the packaging life-cycle where the long-term advantages of permanent and truly recyclable materials such as steel become clear. While packaging such as retortable cartons, for instance, appear to be made from easily-recycled cardboard, they are in fact a multi-layer composition of paper, aluminium and low-density polyethylene among other materials 2. If there is a closure it will be made from high-density polyethylene. Although it is possible to recycle each of these components, it means separating them first; a difficult and costly process which few recyclers are equipped or prepared to carry out. It’s clear that steel’s advantages extend to collection also. Unique magnetic properties make steel the easiest and most economical packaging material to recover from any waste stream, all you need is a magnet. What is the real recycling rate? When considering packaging materials, it is important to consider the ‘real’ recycling rate. 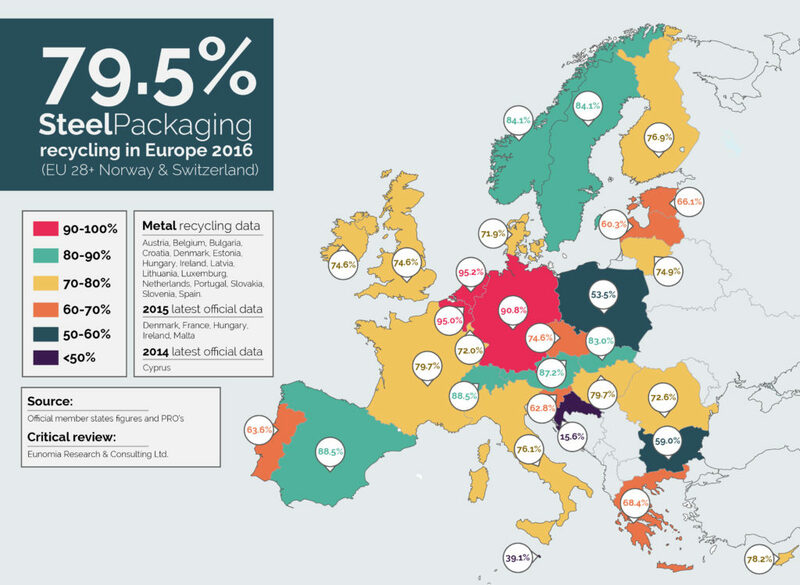 Due to the inconsistent nature of how recycling rates are measured across EU member states, this can be easier said than done. Some member states take measurements after collection, resulting in misleading figures that include waste destined for incineration or landfill. To determine the real recycling rate, measurements must be taken directly after the mechanical sorting phase. In 2016 the real recycling rate for steel packaging was 79.5% vs 47% for beverage cartons and 37% for plastics 3. Which means that, for certain packaging materials on the market today, more than 60% still end up being incinerated or going to landfill. Steel’s high recycli ng rate can be explained, in part, by the fact that steel scrap is a necessary component in the process of making new steel. It’s used as a cooling agent and this creates a clear demand for collected steel scrap. Because of this every single steel plant also acts as a recycling plant, that’s more than 500 recycling plants for steel across Europe to recycle and reuse collected steel. Despite the already impressive recycling rate of steel packaging, we are pushing to increase it even further. 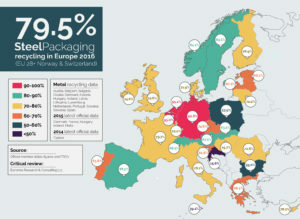 Our 2018 report “Good practices in separate collection, sorting and recycling of steel for packaging” showcases the varied projects, systems and processes via which steel packaging is recycled, and is intended to serve as a central reference for examples of good practice to help all EU members states achieve the higher recycling targets set out in the EU’s Circular Economy Package. Steel for packaging is poised to play a key role in cutting waste and helping Europe to achieve its vision of moving to a more efficient, circular economy. It is ideally placed to help brands achieve their sustainability objectives and offers the consumer clarity and confidence that choosing products packaged in steel is an environmentally positive choice.